Jerry Pryor,74, attempts to dry out his sleeping bag along Norse Way, in Lakewood Village in Long Beach, along what he calls " the trail ". 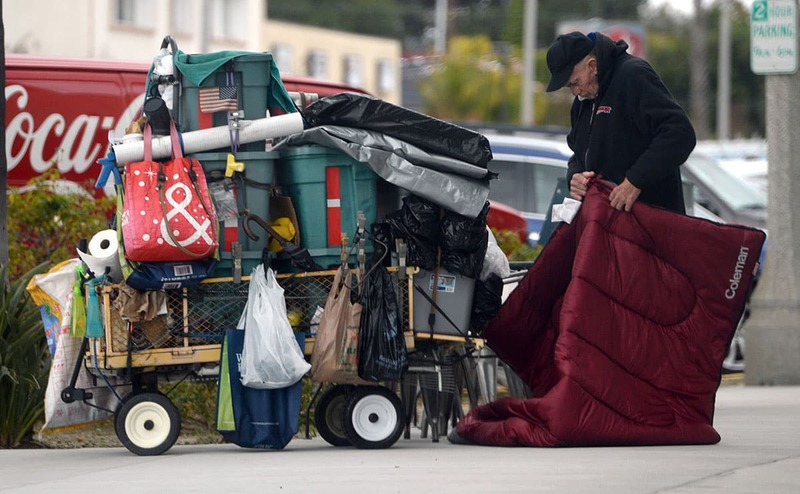 Pryor who was raised in Long Beach, is homeless and has picked up trash and trimmed the bushes, as he pulls his cart along " the trail " for more than a decade. His range runs along Carson Avenue, from Cherry Avenue to Woodruff Avenue. For years local residents and businesses look out for Jerry and admire his work ethic. A GoFundMe account " Friends Of Jerry " has been set up in support of Jerry. Monday, Feb. 18, 2019. Photo by Stephen Carr. The Economic Roundtable, one of the nation’s most reputable nonprofits studying issues of social and environmental justice, announced this week that it has created a tool that could predict—with an accuracy of about 82 percent—the probability of someone falling into long-term, chronic homelessness but the County of Los Angeles wants nothing to do with the diagnostic tool. As reported first in the Los Angeles Times, a battle between the county and the nonprofit has erupted as one of the county’s head counsel members, Principal Deputy County Counsel Truc L. Moore, alleges that the nonprofit misused the data it was provided in order to create the tool. This is not the first time Roundtable—which is no stranger to Long Beach: It provided a minimum wage study for the city in 2015—and the county have gotten into a row: After the Roundtable failed at scoring a bid for a contract with the county to analyze the annual homeless count data, it immediately published a highly critical analysis of the county’s own homeless count. The set of screening tools comes in a pair: The first tool identifies the 8 percent of low-wage workers who become persistently homeless after losing their jobs with an accuracy, according to Flaming, of 82 percent. The second tool identifies the 8 percent of youth receiving public assistance who become persistently homeless in the first three years of adulthood with a noted accuracy of 72 percent. “Prioritizing individuals for access to early, comprehensive interventions is important because the resources that are most effective for preventing homelessness, including subsidized housing and employment, are scarce in relation to the demand for those resources,” Flaming said. The dispute between the Roundtable and the county, with the latter requesting that Flaming destroy the data the nonprofit has collected, is ongoing.